Isla Mágica is a theme park designed for adults and children, the only thing required from visitors is the will to have a good time. Located on the Isla de la Cartuja, in Seville, it is a place where anything can happen, full of magic and excitement everywhere, and you are the main character. 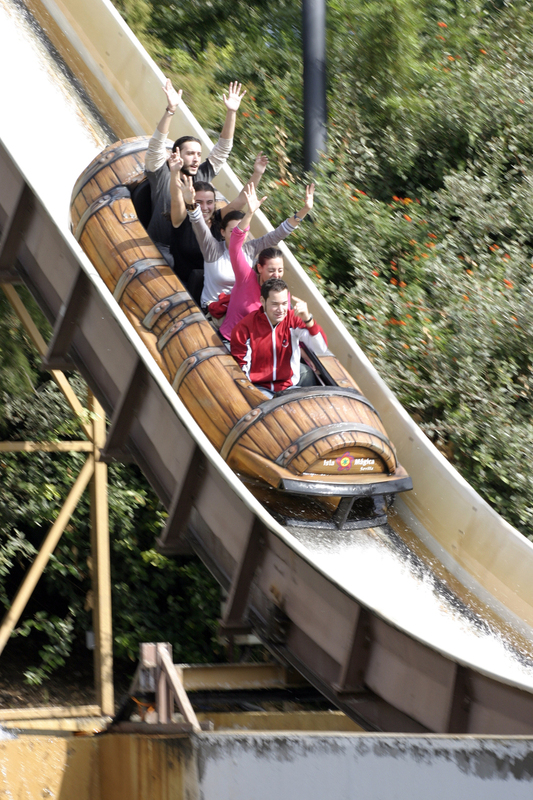 The fun water rides are the most appealing to visitors to Isla Mágica in summer. ¿What is the park like? 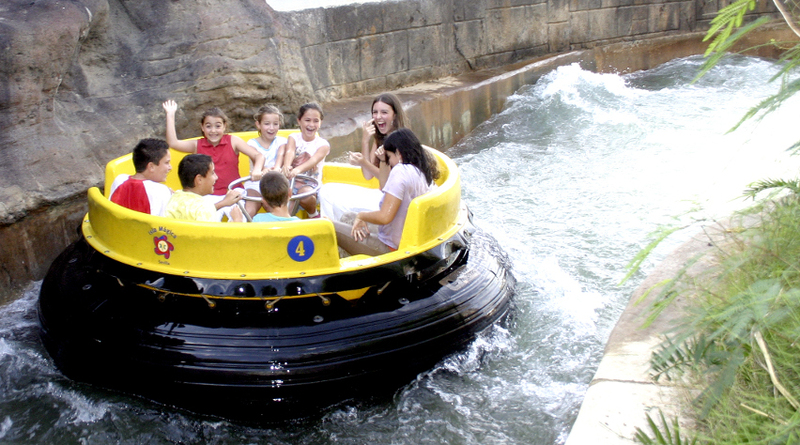 Isla Mágica is the first Theme Park to be situated within a city. It recreates the settings and society of the 16th century, a time when new unexplored worlds were being discovered. The surprise factor is key, because when you least expect it you might run into a pirate who is fleeing, terrified, or a damsel from the Middle Ages strolling through the gardens. My younger son had a great time trying to hide from the pirates. In addition to the performances, shows and activities, it offers many water-based rides, ideal for cooling off on those hot sunny days. A succession of theatre and entertainment performances, which are renewed every year, constantly march up and down the streets. The whole family can become part of the Isla Mágica shows and we saw this as soon as we went in. “Los Modistillas” surprised us by giving us advice on the clothes we should wear, and we laughed a lot. Our first stop was the Puerto de Indias, a representation of the Seville of the 16th Century. We went directly to the Corral de Comedias where magic and theatre shows are performed, to the fascination of the younger ones. 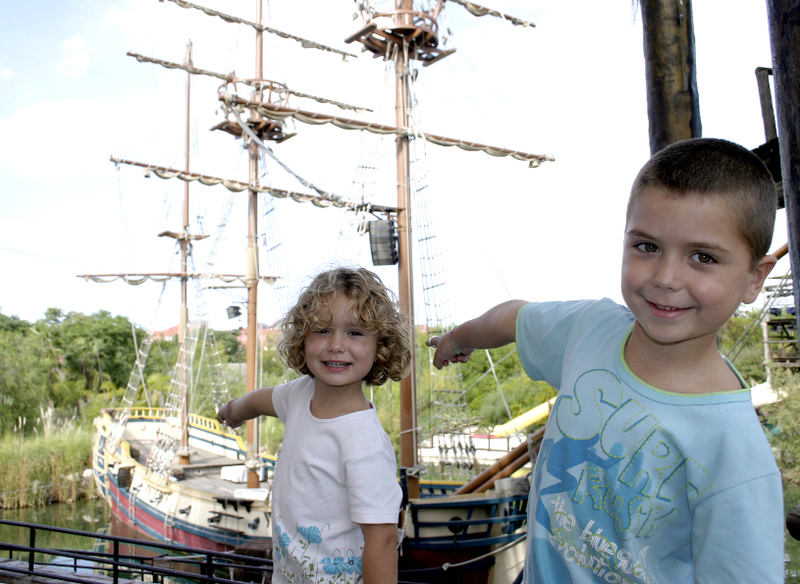 However, if you prefer legends of ships and treasure chests, you can start at La Guarida de los Piratas (Pirates’ Den) where there is a frigate turned into a stage for “El Matasanos” (The Quack) or the classic “El Motín” (The Mutiny). You will see thrilling fight scenes, acrobatic pursuits, jumps and skirmishes, with a grand finale bursting with special effects. Wonderful history lies behind the Potosí Train, as it was the cradle of the world’s main natural riches and is faithfully reproduced here. This space is especially for the younger ones, full of animals, waterfalls, caves, mysterious corners and even dragons, in short, a different world. 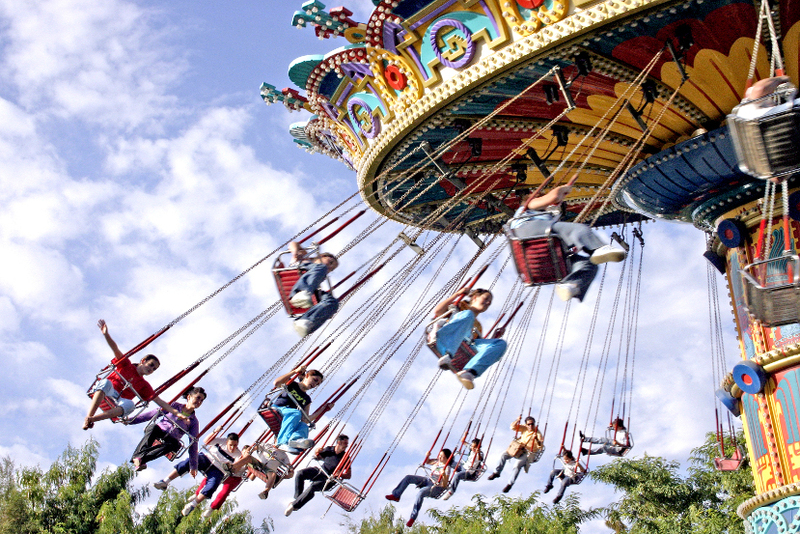 There are different attractions such as “Chrysallis” where my kids rode in a gondola or the “Jumping Frog”, a small gravity-defying free-fall tower. “The Spring wheel” was the ride that the kids liked best, a Ferris wheel with different fun-shaped seats. Puppet and musical shows are a great attraction at The Fountain of Youth, as they tell, for example, the adventures of Pinocchio and other characters. One of the most popular rides is “The Fury of the Gods” in the Quetzal area, where the bravest explorers will enjoy a wonderful trip through the Mayan world. The object is to overcome ten daunting challenges imposed by the gods; will you succeed? We did! At the Fuerte de San Felipe, located in La Puerta de América, we had lunch while watching musical shows. Afterwards we went to the “Potosi Train” a children’s family roller coaster where we discovered the famous Potosi coalmines. Another corner that attracted our attention was Amazonia, with thick vegetation and themed with wooden cabins representing a native village. 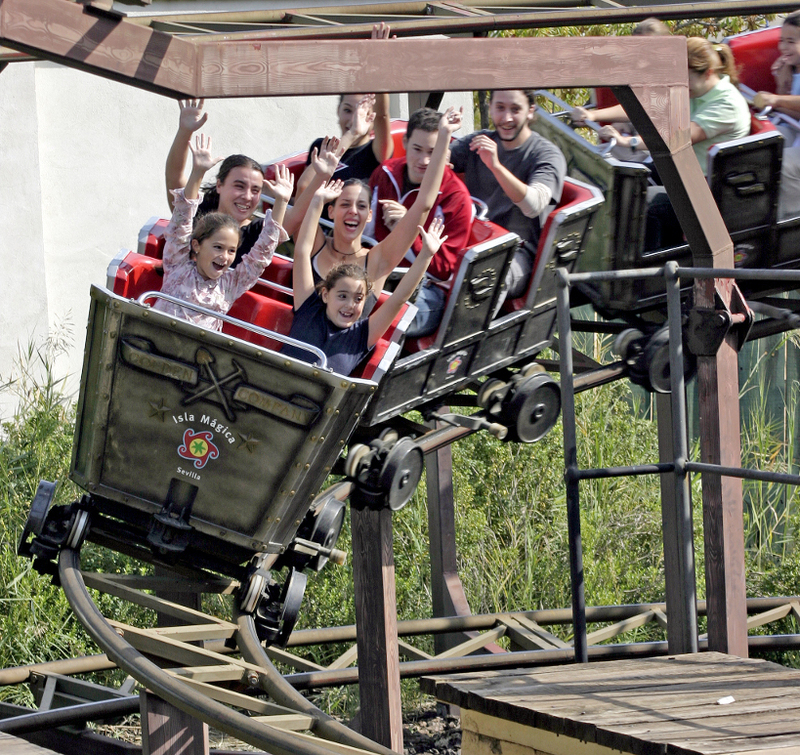 Here you can find, for example, “The Jaguar”, Spain’s first upside-down roller coaster, so if you are brave, get ready for 360 degrees loops and great fun. The tracks run above wooden cabins and different pathways, without a doubt the park’s most spectacular ride. However, as well as amusement there is also an instructional aspect for our children. An example is the Balcony of Andalusia, where you can stroll through a scaled model measuring 10,000 square metres, showing the 100 main landscapes and monuments of Andalusia. Without a doubt, an unforgettable experience to be enjoyed by the whole family. The El Dorado area is a meeting point for the best acrobats, where they put on a lovely circus show. We were all pleasantly surprised by the birds of prey exhibition and the visit to the temples and ruins. However, we still felt ready for some action and the Orinoco Rapids and the Falcon Flight were the perfect combination. El Dorado also offers the magic of audiovisuals, with the “Cinemotion” show, where we were the protagonists thanks to a semi-spherical screen and the seats coordinated with the picture and sound. We also went to the “Dimension 4”, which combines 3D effects with smells, movement, the impression of being underwater, gusts of wind and even lightning. If you want more excitement, you can find it at “El Capitan Balas” where you will have the chance to use a laser gun to shoot at the bulls’ eyes on the set and accumulate as many points as possible to beat your opponents. We split into two teams, parents and kids, but the kids won by a landslide! ¿How do I get to Isla Mágica? The park’s location comprises a good communications network, featuring the motorways that link Seville to the remainder of Spain and to Portugal. 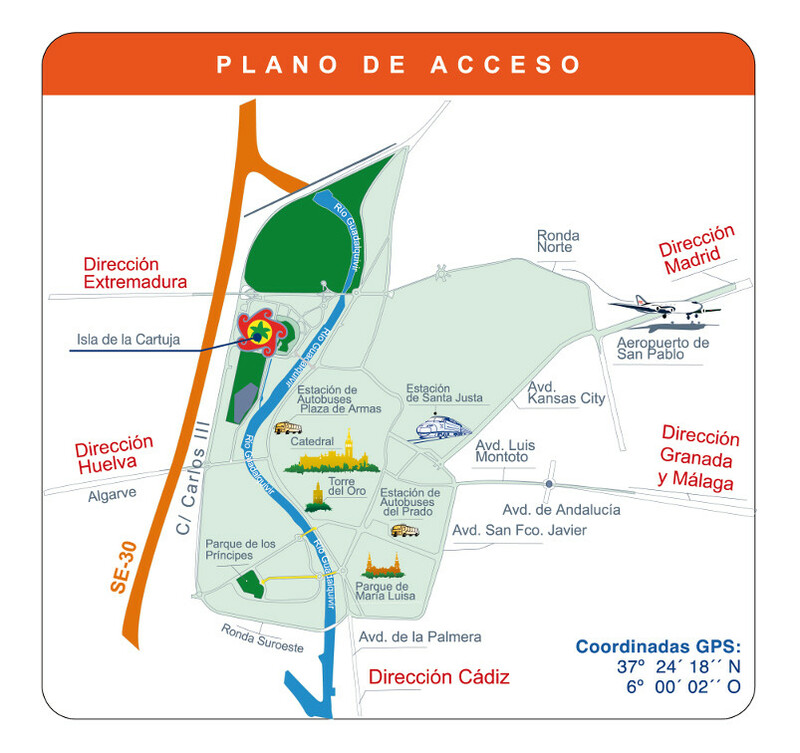 Only a few minutes from the park is the Santa Justa railway station with the High Speed Train. There are also direct flights with different companies from London to the San Pablo international airport, only 15 minutes away from Isla Mágica.